HESA Shahed 285 (Persian: شاهد ۲۸۵‎‎) is a light attack/reconnaissance helicopter developed in Iran. It was unveiled on 24 May 2009. It is being produced in two versions: a light attack/recon version and a maritime patrol/anti-ship version. The Shahed 285 is based on the composite Shahed-278, which is a relatively light helicopter with 682 kg empty weight, derived from the Bell 206 Jetranger. Compared to the American OH-58 Kiowa which retains the airframe of the Bell 206, the Shahed 285 is a single-seater with a narrower fuselage, but retains the tail and powerplant / rotor structures, and is intended for military use. 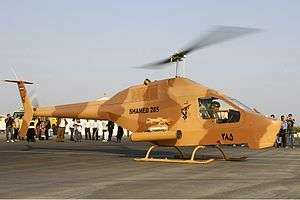 Although designed by the IRGC, this helicopter is scheduled to be produced by HESA. Shahed 285 comes in two variants. AH-85A which is a land based variant and AH-85C which is a naval one. AH-85A is armed with 14 2.75 inch rockets and a PKMT light machine gun either on a rotatable turret or on a static mount, or an NSV heavy machine gun in an underfuselage gondola (latest version). It also uses an EO/IR camera on its top. Instead of the machine gun, AH-85C has a search and track radar on its chin to find and track enemy ships. Its range is estimated between 30–40 km. It either uses two Kowsar or 8 Sadid-1 anti ship missiles. To fire these missiles, AH-85C relies on a Multi-function display on its cockpit. Wikimedia Commons has media related to HESA Shahed 285.